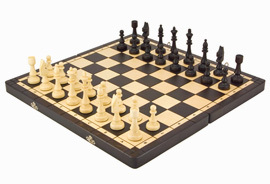 Travel chess sets are the ideal solution for the chess player on the move. The Regency Chess Company stocks a wide range of travel chess sets, from tiny three inch sets, up to twelve inch luxury folding sets. Most of our popular travel chess sets are magnetic, so the pieces are held tightly against the surface of the board during the game. This feature is unnecessary on larger and heavier chess sets, but a really useful feature on travel chess sets. Many of our travel chess sets have been crafted from exotic hardwoods with each and every piece given a high level of detail. Even the really tiny sets are great works of art and have been greatly received by our customers. 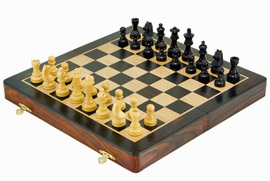 Our travel chess sets are imported from a variety of countries, we make a point of only stocking the very best in quality and style so that which ever set you order, you can guarantee that quality will be in abundance.